Coffee is one of the most widely consumed beverages in the world. It is prepared from the roasted seeds– commonly referred to as beans – of the coffee plant, and is usually served hot but can also be served cold. Caffeine is one of the 1500 constituents of coffee that gives coffee its distinctive character. It occurs naturally in coffee beans as well as in tea and cocoa. Caffeine also acts as a mild stimulant, increasing mental alertness and speeding up the thought process. It is because of this that some people prefer to drink decaffeinated coffee, particularly in the evening, when they might wish to relax and sleep rather than be alert. For the freshest and best tasting coffee, you should grind it right before brewing. This will give you a rich strong flavor. Also, it is very important to grind the coffee in the right form for the brewing you will do. Grinding too fine or coarse for certain brewing methods will not work. Generally, the shorter the brewing cycle, the finer the grind required to produce optimal flavor extraction. The longer the brewing cycle, the coarser the grind required. 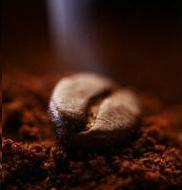 Fine grinds expose more of the coffee's surface area to the water and the coffee's essential oils are released faster. Longer brewing methods require a coarse grind to avoid over-extraction. For example, espresso brewers can produce a cup of espresso in just 20 seconds, so they need a very fine grind. A grind that is mismatched to the brewing method can produce a bitter, overly strong coffee, or one that is weak and lacking in flavor. Blade grinders actually just blend your coffee beans. They are cheap, easy and quick to use, and readily available. However, blade grinders are very inconsistent; you may end up with chunks beans and powder. Also, the blades add the element of friction and heat. This makes the coffee loose its essences and aroma and taste burned. When using blade grinders, press the button at quick intervals of 2-5 seconds. This prevents the beans from heating up. Also, holding the machine firmly with both hands, shake the grinder up and down while you grind for better consistency. A course grind requires 7-10 sec of grinding. A fine grind requires 15-20 sec. Burr grinders are clearly the best way to grind your coffee because they crush your coffee instead of slicing it. This way, the consistency is much more even and no heat is added. However, they do cost more than Blade grinders. Many commercial coffee grinders use these machines but there are many countertop models. There are many ways to brew coffee and it is important to know how to do each technique properly; brewing is a key factor in how your coffee tastes. As opposed to drip machines that only pass the water through the coffee and a filter, the French press, also known as a press pot, actually brews the coffee with the hot water. Then, a metal filter is pressed inside the pot and it traps all the coffee grinds. This method leaves the coffees oils and rich tastes and aromas. With the French press, you also have a lot of control. You can make the temperature of the water much hotter, it should be around 190 to 200 degrees Fahrenheit, a temperature that drip makers can not reach. You can also control the amount of coffee you want to add to make it stronger. And also, you can control the brew time, which should be about 4 minutes. The French press is also extremely portable; you do not need electricity or lots of space, just hot water. An important tip to remember is to take out the coffee; do not leave it in with the grounds after it is brewed. Like French presses, vacuum brewers make the coffee together with the hot water. However, these are not very common and are hard to find. A vacuum brewer has an upper and a lower chamber connected by a thin tube with a small filter inside. Ground coffee is placed in the upper chamber, and water is placed in the lower. As the pot is heated, the water slowly rises up to meet the coffee in the upper chamber and begins to brew. Finally, the water is cooled and the coffee seeps back into the lower chamber through the tube, leaving the grounds behind. The top chamber is removed, and you can serve the coffee. These can be electric or stovetop. The toddy maker is an uncommon tool, which uses a cold-brewing method that creates a coffee concentrate. This concentrate is then mixed with hot water to make coffee. Then, the concentrate can be refrigerated and used to make one cup of coffee at a time, whenever you desire. This method is exceptional for coffee drinkers with stomach problems because the resulting coffee is very low-acid. However, this method does take a great deal of time because the water is cold. Plan to brew over night for multiple cups of great tasting coffee! Permanent filters are superior to one-time-use filters because they let more of the coffee taste in. Permanent filters allow for more liquid (as well as aromatic oils) to pass through, and the end result is more flavorful. Look for gold plated filters because they do not leave a metallic after-taste. Paper filter coffee brewing is very quick and efficient, but it clearly produces the worst tasting coffee. If you are a person who has never had their coffee brewed another way, buy a French press and experience the difference!